Sandwich is the line-following robot detailed in David Cook's book, Robot Building for Beginners. The book and robot are great for the beginner classes since it goes into detail about each component that make up Sandwich. Each member in the beginner class builds their our individual Sandwich for the hands-on experience of working with electronics breadboards and shop tools. 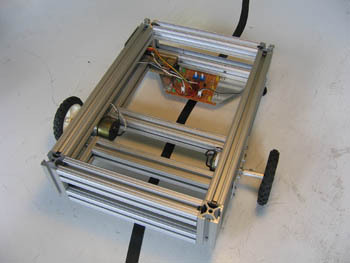 The electronics can be adopted to a larger frame made of 80/20 aluminum extrusions as seen below. 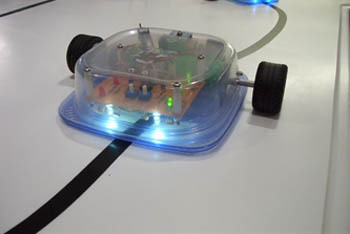 One student built a six-wheeled vehicle using the same electronics circuit. The outer cover is made with a Gladware sandwich container, hence the name Sandwich. See the parts list and cost sheet with a list of suppliers. 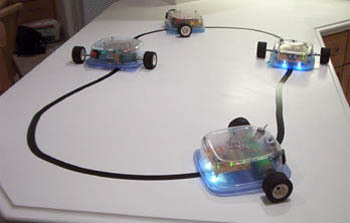 The first two classes that built Sandwich used the point-to-point soldering method outlined in the book. The beginner classes found this method frustrating and the success rate for a completed Sandwich was less than 50%. It is strongly suggested that you buy the Sandwich printed circuit board; our last class used these and they were 100% successful.